DHANGADHI, Jan 16: A-Division runner-up Sankata Club has advanced into the semifinals of the ongoing International Invitational Khaptad Gold Cup football tournament with a 1-0 win over Cameroon’s Dauphins Club on Tuesday. 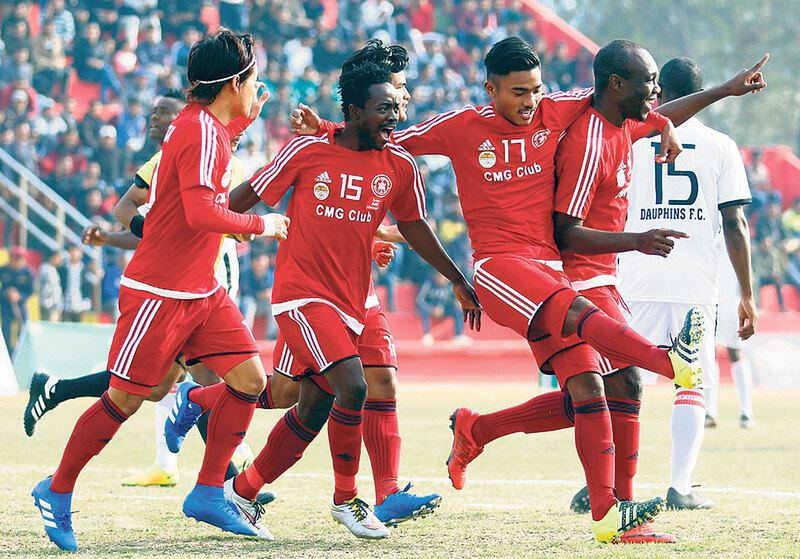 At the Dhangadhi Stadium, Sankata scored in the second minute and the goal was all, but enough to secure a victory. Ellon Maxwell scored the goal for Sankata after receiving a pass from Laxman Ruchal. Sankata got other chances in the game too, but could not capitalize them. Ruchal was in a one vs one situation in the 12th minute, but his shot was saved by Dauphins goalkeeper. Dauphins got chances in the game as well, but its captain’s shot from inside the penalty box went wide off the target in the first half injury time. Dauphins had a chance to equalize five minutes into the second half as Armel provided a cross to Junior, but his header went wide off the target. Tina gave a cross to Niya, but his header from six yards out went over the bar in the 53rd minute. Junior gave a pass to Tina, but his shot two minutes from time went wide off the target. Sankata head coach Salyan Khadgi appreciated the players for following the tactics and playing well. “We were successful in winning the game as the players performed according to the tactics set,” Khadgi said. Dauphins head coach Aashik Thapa Magar said that the team had to lose unexpectedly as it traveled from a long distance. “The players could not perform as expected because they had just come from a long journey,” Magar said. Sankata captain Ravi Silwal was adjudged the man of the match and was rewarded with Rs 10,000. Sankata will now take on departmental team Nepal Police Club on Thursday.